In the second Service Design Breakfast event this fall organized by Aalto University and Startup Sauna on October 16, Reaktor presented the case where they integrated service design with lean software development. The project, done for Barona, was about creating software that would find best match between jobs and job applicants. Starting point was construction sector where Barona had to do a lot of short term contracts but didn’t have IT support in place. Paper form that was used for the contracts had 200 fields! Unsurprisingly, success rate in finding the best match was not at adequate level. Project was done following Kanban method. Initial hassle involved producing a lot of UI design and heavy discussion what were the most important features that would actually be developed. The main challenge was how to define minimum viable product (MVP) to be able to launch early and enter the loop of learning. Getting early to production appears so crucial that the Reaktor’s learning suggests that is better to go early with minimum product (M_P) even if it doesn’t do much useful things, then to do too much with viable product (_VP) and waste time and money. 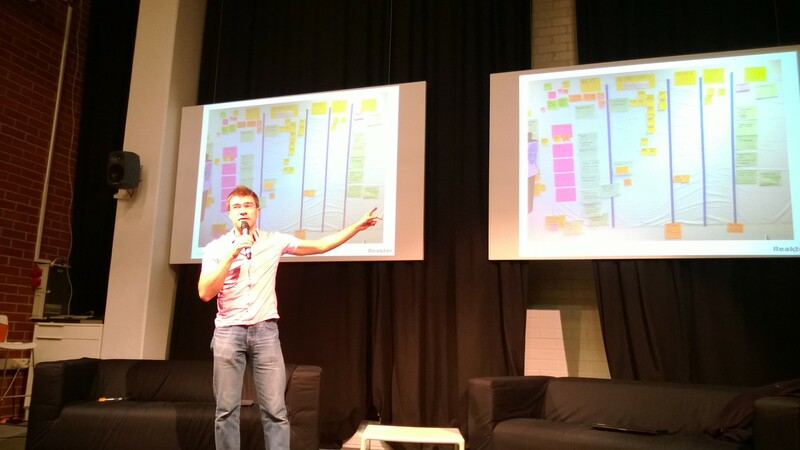 Reaktor’s team decided not to have Product Owner, as it was very difficult to get a good one in the past. Instead, they asked customers directly what the value would be. They selected key stakeholders from customer side – real people with whom they develop good relationship. They brought them together to discuss and prioritize features. Their input helped in defining MVP. After the launch, in addition to regular users’ feedback which was about “what” worked, what didn’t and what is missing, those stakeholders were able to answer important question “why”. Such understanding enabled team to start fixing the product remarkably fast releasing the most valuable changes to production within four days! As the product continued shaping, “great ideas” started popping up from customer’s side. Traditionally, team would say “we will put it in the Backlog”, in other words “forget it”. In the spirit of design thinking (combining empathy, creativity and rationality) Reaktor’s team has found simple solution how to deal with those initiatives. Every new idea was written on a red post-it note and discussed with the customer in front of the Kanban board that already had red post-its containing proposals from others. This introduced transparency and enabled discussion about real value of new ideas in comparison with other ideas and features being developed. Interestingly, none of these ideas ended up implemented in their original form. Service design applied in pre-launch phase enabled early launch with MVP and later on value delivery through the iteration loop, resulting altogether in much leaner development. Very much because of this approach, Barona project ended up as one of the most successful projects done in Reaktor and showcase of effective service design integration with lean software development. The video of this Service Design Breakfast presentation is here. ← “Doing things differently” or “Doing different things”.